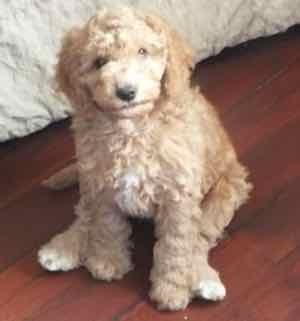 Perhaps the perfect labradoodle puppy fo you will come from one of our Australian labradoodle mothers. 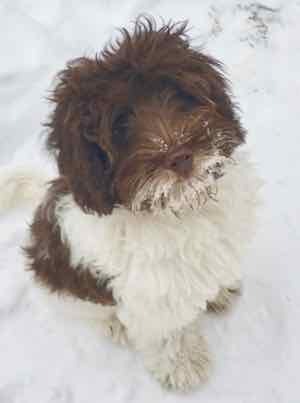 Our labradoodle breeding dogs are descendents of the Service Australian Labradoodles first bred in Australia. Chocolate Lexi is our darling pet. 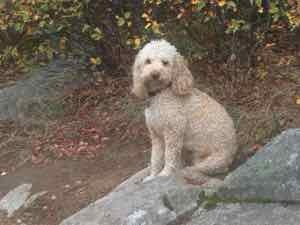 We have always loved her mother, Canadoodles’ Vicky who is called Ginny. When Karen McKay of Canadoodles came with Tom to dinner and asked what she could bring Jean asked for a puppy. Not the usual dinner contribution but Karen brought us such a wonderful girl that she got us through a rather sad time when our dear pet Annabel went to the angels. Lexi is full of fun and mischief. She is very affectionate and just a little spoiled. Lexi has always loved the puppies that have been born at Over The Moon. Although we are careful not to let any of the dogs get too close to a mother labradoodle and her young puppies when the time is right Lexi is always the first up for a puppy visit. She and her best buddy Savannah would play with young puppies all day long. Both of them have such sweet natures and love everybody and every thing. 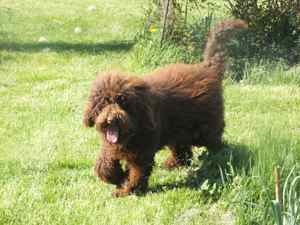 Lexi has a wonderful nonshedding, soft curly wool coat that has kept its wonderful chocolate colour. Lexi is curious, loyal and happy. She is a delightful and easy member of our family and the favorite of our grand children. Lexi was born ‘Canadoodles Vickie’s Unique Unice’. Chanel is a full of life smaller chocolate and white party girl. 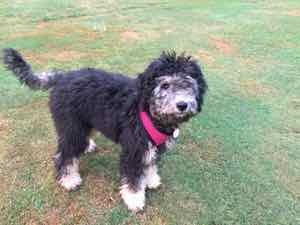 She came to us from Hales Labradoodles in California and hopes to become a labradoodle mum when she completes her testing in the near future. Chanel loves going with her family in the camper, greeting visitors and being friends with her sister the Dachshound. Chanel and her family live in Oliver BC. Size: 17 inches at the shoulder and 17 pounds. Carmella is a charming very feminine young lady. She is the daughter of our Savannah and Chester. Carmella is a new mother in 2019 to a litter of 6 beautiful puppies. Carmella lives with our very good friends John, Penny and Snowy here in Grand Forks. Bella is our charmer from our Lexi and Canadoodle’s Xavier. Bella is full of life and has grown to be almost the size of Lexi, her mother. Bella given us a beautiful and popular litter of puppies and was a wonderful mother to them. She passes on so many great characteristics. She lives happily with her guardian family on the water in Nelson. Olive Blossom has now given us two beautiful litters. She is a lovely young lady who has the sweet nature of her mother and her grandmother. Olive’s grandmother is our first Labradoodle, Lilyanna. 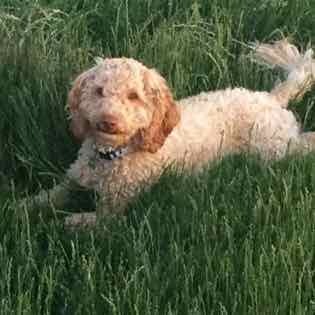 This is a special line as Lilyanna was from the last litter of Canadoodle’s Tassi who had the first litter of Australian Labradoodles in North America. She was born as part of the original breeding program in Australian. Although a large miniature, because her parents are medium she could carry the genes for somewhat larger puppies. She is 27 pounds. She lives with her adoring guardian family and her mother Sadie in Vernon, BC. Tia is our beautiful phantom girl. She is the daughter of our Phantom boy Barnaby and our Guinivere’s Coco. We were so excited to keep this beautiful gir and hope for phantom puppies one day that look like their mum and grandfather. Tia is a delight and lives with her loving guardian family in Nelson.